With every investment portfolio, there are gains and losses. At BTCjam, we do our best to help investors minimize these losses and maximize gains with our industry-leading credit scoring algorithm which we leverage to keenly price every borrower¹. Additionally we allow investors to to quickly diversify a portfolio by utilizing the investment tool AutoInvest. All investors also have access to extensive performance reporting on their investments which provides clear insights on the portfolio’s performance. As a legacy, BTCjam has always emailed these arbitration awards one-by-one to investors. However, feedback and research has led us to create a more efficient process where the status of the arbitration process will be updated on the Investments page. Once a loan has gone into default (90 days after the first missed payment) you will be able to access a notification that the loan is set to go to arbitration after a 14 day waiting period. You can access the arbitration award and download the PDF directly from the investments page. We will send a monthly email report of your arbitration awards within your Monthly Account Review email. More about this below. Please note: Arbitration awards can only be accessed on the Investments page if the loan listing’s default date is on or after January 27, 2016. TIP: Those of you who enjoy being kept up to date on listing’s activity, but do not like an email per comment, we suggest that you go into your settings and define the COMMENT EMAILS section to daily. You will then receive a digest where can access all of the listings that received comments on that day. Thank you for choosing BTCjam for your financial needs! If you’re not a current member, create an account. The enrollment process is simple and you can earn up 18% returns on your bitcoin¹. ¹ This information is not intended to be investment advice. Loans invested in via BTCjam are not guaranteed or insured, and investors may lose some or all of the principal invested. You should consult your financial advisor if you have any questions or need additional information. Actual results may vary. Current and/or historical performance is not a guarantee of future results. Loans invested in via BTCjam are not guaranteed or insured, and investors may lose some or all of the principal invested. If you’re investing with Bitcoin by buying and holding long term, – you’re doing it wrong. Today I’ll try to explain four basic rules that I follow in order to maximize my Bitcoin investment potential. It has been almost a year since I got acquainted with BTCJam and now I realize how little I knew about Bitcoin investments back then. Keep in mind – what is written in this post is my own personal opinion about investing and you can choose to accept it or reject it, but never do anything just because “someone said so”, always understand the motive for your actions. I have many currencies I deal with, and for each currency I have a different portfolio. For example, for US dollars I have some of my money invested in stocks, bonds and some in Bitcoins. Under this portfolio Bitcoin will be considered as a stock, mainly due to the fluctuating exchange rate and the fact that I do not get a steady stream of income out of it. If I look at my Bitcoin investment portfolio, just buying and holding the currency itself would be considered as normal “cash” and my cash wouldn’t be bringing in any return. It’s the equivalent of just keeping your money at the bank without investing it. When investing in BTCjam under this portfolio I consider the investment to be a corporate bond with a specific BTCjam rating. If I wanted to invest in stocks under my Bitcoin portfolio I’d need to find a company that is valued in Bitcoins and not in USD. However, I don’t see any reason to do so as BTCjam’s investments yield competitive returns. Interestingly, BTCjam also saw the importance of diversification and received feedback that they acted on – with the launch of AutoInvest feature about a week ago. Instead of having to browse individual listings, an investor can easily diversify in 100 loans with specific quality and term parameters! One button diversification, now that is an EASY button. But if you are the investor who wants to control which specific loans get invested in, and want to understand how to do that effectively – read on. Expected Yield and Rate – Most people would prefer to get the highest yield they can. I personally believe that people who have super high yields have a serious risk of not paying back their loan. On the BTC platform the lowest yield I could currently find was 22% and the highest was 37%. You’ll notice there is a high correlation between the Yield on an investment and the low BTCjam rating of a user. Even though I’m not aware of the whole process a user goes through in order to get the BTCjam rating I’m sure this means something. The user’s profile picture – nothing spells trouble more than a blank profile picture. Has this user repaid previous loans – I never invest with someone who hasn’t repaid a considerable amount of money in loans in the past. User credentials – Has the user connected his Facebook profile, LinkedIn profile and other profiles to BTCjam. If so it means he is open about his identity which is a positive indicator. How long has this user been a member of BTCjam – I shy away from users who joined in the past 3 months. BTCjam’s rating – This will usually correlate with my own findings about the profile but I treat this as a second opinion to validate my research. What is the investment for – If there is no detailed description for the investment I will not invest. An important question that should be answered is what will the investment be used for. 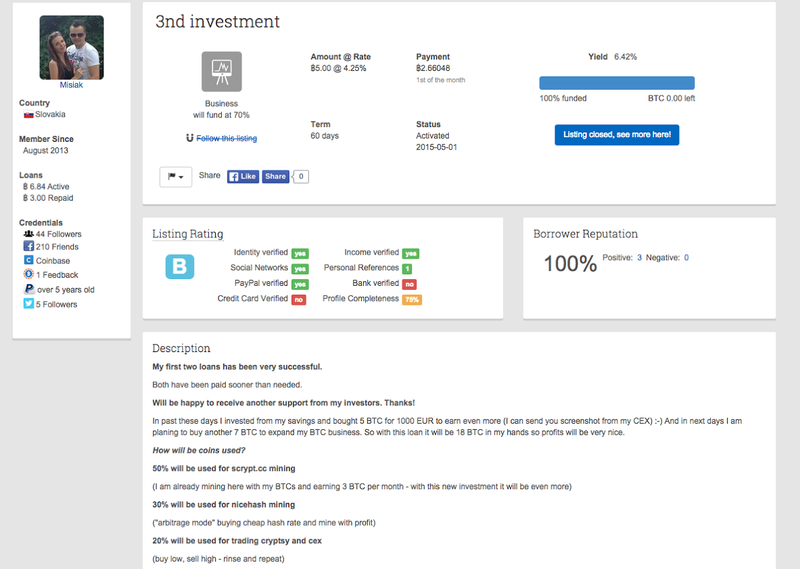 Here’s an example of my latest investment – you can take a look at the profile and detailed description. Probably the most important guideline of them all – Never invest an amount that is crucial for your survival. I’m a believer in Bitcoin but still I keep only a fraction of my entire wealth in it – why ? Because it’s too risky not too. Whenever I enter a risky investment (e.g. Bitcoin) I try to imagine how would I react if I lost all of it. If the thought is too scary, I just don’t do it – or I lower the investment amount. Bitcoin is a risky business, and BTCjam investments make it even riskier by lending it to strangers – but if done wisely, these investments can grow your Bitcoin wealth over time. If you don’t find any good investment – don’t invest! Sometimes you just won’t be able to find someone that matches your criteria. In this case you’re better off not investing and checking back to see if there are new investment opportunities in a few days or so. There are so many scammers out there and Bitcoin is still an extremely risky business. For example, in my initial review of BTCjam I also cover a Bitcoin investment website called “Bitcoin Trader”. That site later on turned out to be a HYIP and many users (myself included) lost their money. There is no such thing as “easy money”, make sure to conduct proper research. To conclude, I believe that if you follow these guidelines your chances for success will increase dramatically. Please remember that this is based on my own personal opinion and experience (I have no formal investment certification). I recently finished getting back a loan on BTCjam and just invested in a new one with a larger amount of money. Hopefully this one will go well also and I can move on to additional investments and update you about them as well. If you have your own investment tips please feel free to leave them in the comment section below, I’d love to hear them.